Did you know that you can install a wood burning stove in a smoke-free zone? Yep, if you get the right product and operate it properly, no smoke will come out. Amazing, isn’t it? You’ve come to the right place. You get to see the best wood stoves on the market today and an extensive user guide on how to run them correctly. Our experts have compiled a guide in order to give a quick heads up! Wood stoves nowadays cover all the regulations when it comes to fumes and emissions. Burning wood doesn’t pollute the air and you get 10 times the effectiveness of electrical heaters. See which products stand out and then make sure to become familiar with the right way to kindle a fire and maintain a wood burning stove at home. Read away and have fun! DIMENSIONS : 24.5 x 27 x 30"
Heat Coverage : 2,000 sq. ft.
DIMENSIONS : 21 x 14 x 11"
Heat Coverage : 1,000 sq. ft.
DIMENSIONS : 29 x 30 x 38.8"
Heat Coverage : 2200 sq. ft.
Heat Coverage : 1,800 sq. ft.
Heat Coverage : 2.400 sq. ft.
DIMENSIONS : 17 x 18 x 24"
Heat Coverage : 800 sq. ft. Almost any wood burning stove can be used as a main source of heat and this is the case here as well. 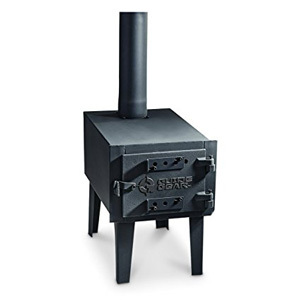 The US Stove Company 2000 Wood Stove is a mid-sized product which will be just enough for most common households. It has a 2 cubic foot firebox. 21-inch logs are the longest pieces you will be able to fit in there but this should be quite enough. Thus re-stocking the stove happens rarely and more heat is obtained. The BTU ratings of wood stoves are unmatched by other heating products and here we have a BTU of 89,000. It is not recommended that cooking takes place on the stove. However, a kettle can easily rest there and warm some water or use it as a humidifier. The stove blower is a convenience and the ashtray is huge making the stove easy to maintain. This product should not be installed in a fireplace. This wood stove features two materials. The body is made out of galvanized steel and the door consists of sturdy cast iron. There are hinges for extra convenience. The whole product is built for a convenient outing and the set contents show it. There are detachable legs and assembly hardware. All of this will make storing and transporting easier. The 5 pipes which come with the stove are easy to mount as they fit in one another without any problems. There is also an adjustable air vent on the cast iron door. Additionally there 2 tools included. An ash rake and a fire poker. The fire poker is also used as a door opener for safety. 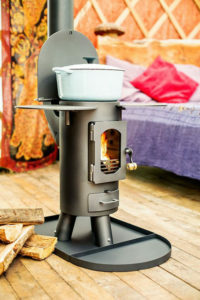 A key factor here is that the Guide Gear Outdoor Wood Stove cannot be used indoors and even when used outside, proper ventilation should be present. It can heat up to a 1000 square feet. 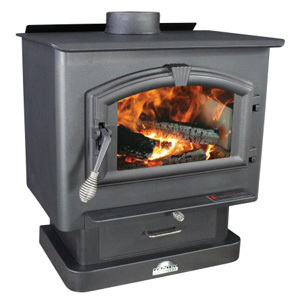 This next stove we have on our wood stove reviews list falls in the “large” category and the price correlates to that. This heavy-duty product is excellent for heating large spaces namely a space of 2200 square feet. Once it is fully stocked up, it will burn continuously for at least 8 hours. Nothing needs to be used as a door opener as there is a chrome handle. In terms of other materials used, the firebox has brick layering while the ash lip is made out of stainless steel. The glass window of the cast iron door is in fact made out of ceramic. Among the cool perks, we can list an air wash system and the sliding draft control. Another important component is the variable speed blower. The emissions rating is quite good as it stands at 3.6 grams/hr. The stove comes with a 5-year limited warranty. Cooking on it is not recommended. 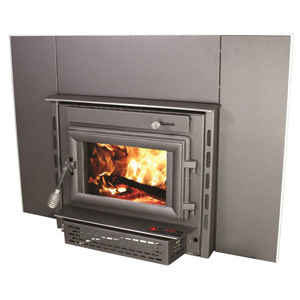 The Vogelzang Colonial EPA Wood Stove is one of the more massive products we are reviewing. It is so popular because its main feature is to be a fireplace insert. It will truly change the look of any existing hearth. The cast iron door has cool touch wooden handle making it easy to interact with. There is a 16 x 9 –inch ceramic window which allows you to enjoy the burning inside. There is no extra exhaust pipe and the hole on top needs to be used. Pipes are not included in the set and it is recommended that it is connected to an at least 12-foot chimney. The reinforced plate steel body will give you security while the firebrick lining inside the firebox is rather easy to clean. The hearth needs to have dimensions of about 31 x 44 inches in order for this wood burning stove to fit properly. Here we have a model with an impressive, for its size, firebox. It gives us almost 4 cubic feet of space and that means we can get at least 10 hours of burning. 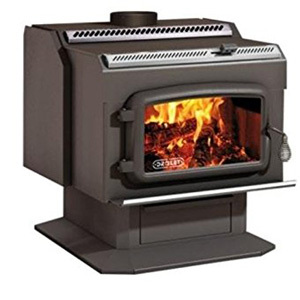 Additionally, you will be able to fit not one but 2 21-inch logs and enjoy heat for longer. The emissions are 3.8g/h which is definitely a good rating. The 5/16-inch steel plate on top of the stove can be used to warm some water. Another convenience is that the water can be vaporized and thus a humidifying effect will be achieved. Cooking is not recommended. The efficiency rating is 78% which is definitely not the best one on our list. It is pretty good, though. The handle of the cast iron door is adjustable. The air control on top is not hard to operate. Bear in mind that the BTU rating depends on the purity and dryness of the wood used. This is a small wood burning stove but will be just fantastic when used in the right room. The product will heat up space of about 800 square feet. Not very big logs can be fit in there as the depth of the firebox is about 17 inches. The retailer suggests that 12-inch logs are used. The handle on the cast iron door is made out of wood so it will be safe to touch at any time. With the proper cordwood, one will have the chance to get about 21,000 BTU from the Hi-Flame Shetland Wood Stove. The presence of the top flue is crucial as it shoots all the smoke and emissions directly upwards. There is an option to also have the flue on the back, though. The unit is also 100% EPA certified. Unfortunately, there is no air control with this wood burning stove. We now kick off our wood burning stove tips and tricks by talking about how to actually operate one. This process shouldn’t be overlooked as there is actually a proper way to light your fire at home. It doesn’t matter whether you are using a wood burning stove for the first time, you have to learn to do it right straight from the start. You know what they say “If there’s smoke then there’s fire”. Well, it actually should say “there’s a badly started fire” because if you do it properly there will be no smoke coming from your chimney. We will talk about that more below as it is directly related to maintenance but let it sink in for now. So here we will go through the 6 main steps which will show you how to operate a wood burning stove correctly. You will also see a number of other useful wood burning stove facts. What you need is very dry and well-seasoned wood. If it is green or somewhat alive, it will not yield good results at all. Fresh logs will dramatically reduce the heat output and will cause excessive smoking without starting a flame. Getting it just right typically requires time and patience. You need to store your logs for at least 6 months in order to let them dry really thoroughly. Keep your pieces of wood away from rain and moisture. It is recommended that you buy a moisture meter (they sell them everywhere) and monitor the levels of moisture. You are aiming at values of 20% or less. Anything greater than that is virtually unusable. You shouldn’t expect to have a huge fire in that firebox right off the bat. You need to put some smaller pieces and fire starters initially. Don’t just throw in the big log. This is because a high temperature needs to be generated before the “big boys” enter the game. A small fire can get pretty hot and that’s your goal. Put in small pieces of paper and keep feeding it little pieces of dry wood. Pine is simply great for this endeavor. Keep the door open for about 1 minute when you are doing this. Oxygen is vital (pun intended) for fire as well. Once you are happy with the temperature of the stove start putting in larger logs. Do it 1 by 1, though. You want the whole body of the stove to become hot. The high temperature will definitely aid flaming those big logs you are trying to put in there. If you pile up wood inside the firebox you will practically “strangle” the stove as no oxygen will be able to pass through. Don’t get frustrated and simply take it easy. So in order to keep the whole thing going, you need to be both careful and active with the air control. This is a feature which every good wood burning stove has and it is imperative that you use it. Don’t shut it off completely as your fire will like to be put off. If you overload your stove you will start seeing a lot of smoke. Excessive smoking doesn’t mean you are doing a good job. On the contrary, it will likely create creosote which sticks to the pipes and the chimney. It will be troublesome in the long-term. These cast iron doors are there for a reason. Once you close the door of the stove, keep it that way. If it stays open you run the risk of having things jump out of there which is a fire hazard. But that’s not all. If oxygen is freely flowing through the firebox, it will direct your heat to the chimney. You want it in your room. This is actually a very important topic. Burning trash is, in fact, illegal in many states and countries. It will never do you any good as it will just clog your stove, pipes, and chimney. Not to mention that it will smell awful for you and your neighbors. Burning garbage is also incredibly harmful to nature and the environment. Those fumes and emissions must never be released into the air. Yes, little amounts of paper can be used in order to start a fire but that’s it. Make sure you stick to using firewood, fire starters, and manufactured fire logs. Even the most efficient burning wood stove will have a hard time functioning properly if maintenance is overlooked or plain bad. Poor maintenance also bears a number of fire hazards and this is why no corners should be cut and no aspects should be overlooked when cleaning your wood stove. Below we will describe the two main reasons why extensive care for your wood stove is imperative. We will start with effectiveness and then will move on to safety. You need to be ready to fully devote to the preservation of your stove if you are going to buy one. Similar to most things, proper maintenance will prolong their shelf life and will allow them to perform better. This goes for cars, vacuum cleaners, all sorts of domestic heating and cooling devices, and is especially true for a wood burning stove. Did you know that if your whole installation is clean, you might reduce the amount of wood you use by 1/3? This is mind-blowing. You can spend 33% less money on heating if you only pay good attention to the stove you use. The best sign you haven’t done a good job is the presence of smoke. If your stove is functioning properly, it will not blow any smoke. This is beneficial to you, your neighbors and the environment. Maintaining a wood burning stove results in less harmful emissions making that process even more vital. In addition to always keeping the stove clean, you also need to make sure you use proper fuel. This reason, of course, is just as important especially when we look for ways how to keep a wood stove burning all night. 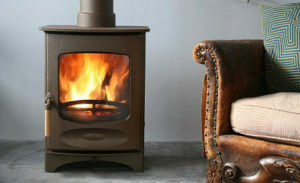 Knowing what is safe and what isn’t is simply crucial for any wood burning stove owner. There are 3 things that might cause fire problems and you want to stay on top of all 3. The first one is directly related to proper wood burning stove maintenance and we will go over it before talking about the bottom 2 as well. Chimney fires are bad because they are pretty sneaky. Many people do not even realize what happens between their stove and the end of the chimney. This is what we are here for. We will now take you through the full procedure of keeping your stove, pipes, and chimney clean. Failure to do so will result in excessive smoking and might even lead to a fire hazard in the long-term. Your chimney needs to be swept annually. Creosote and soot are generated in there and they can become quite dangerous. Once a year you need to call a wood heat professional who will check and inspect your whole installation. You will see a pattern here. The higher you go in the heating system, the less often you will need to clean it. Once you get down to the piping and the actual stove, your interference needs to be more and more frequent. Many households keep their wood stoves working 24 hours a day for a few days. While this is alright, you will also need to put down the fire once in a while so that you can actually clean the firebox. The best products have brick lining in there meaning that combustion happens easily but so does the cleaning. Once you are sure the ash is cold make sure to scoop it up using a metal trowel. If you have an ashtray then that’s great. Clean it every few days before you notice any build-up. Hot ambers are not your friends. Use caution and make sure it’s all cold and dead. Don’t remove all the ash, though. Leave about ½-inch of ash on the bottom of the firebox. This creates sort of an insulating layer. It will help you start your next fire. Use a metal container. Don’t dispose of ashes in your household garbage! Once you are happy with the amount of ash left, make sure your stove is at room temperature. This is where a can of fireplace glass cleaner will come in handy. It is sold virtually everywhere. Help yourself to a soft cloth and clean the window of the stove. It is important to do this next step the first time you light a fire after a cleaning session. Leave the air control wide open for about 10-15 minutes as the fire is burning. This will help reduce the amount of creosote generated. Feel free to do this for a whole week during the winter season. Start by popping the pipe out from both the stove and the wall or ceiling. When you are kindling the fire is when this area sees the most action. Flames usually get up into the pipe. That’s how creosote is generated. In time, it piles up and every next kindling worsens it. These little “fingers” of soot and creosote constantly catch fire and get deeper in the chimney. Once you have the pipe out, take a look at the hole in the wall with a flashlight. You will see these wispy things hanging down like stalactites. You don’t want them there. Scrape them off using a brush or a metal stick. You need to do this maybe every 5-6 weeks. This area simply a critical factor and needs to be addressed. A quick tip from us here is to maybe even inspect your whole chimney from here. Grab a small mirror which fits in your palm. Stretch your arm inside the pipe in the wall. Adjust the mirror so that you can see daylight. You should be able to see the 4 walls of the chimney. If you are satisfied with the amount of creosote or lack thereof then your chimney doesn’t need cleaning immediately. Now grab the pipe you just pulled out and go outside. It is pretty obvious what needs to be done here. Scrape off all the build-up from inside the pipe and once you are satisfied with it, have it re-inserted. If you have a chimney cleanout underneath your house then we got news for you. You have to go down there periodically as well. This doesn’t need to be done after every pipe cleaning but you don’t want to leave soot sitting there for too long. Rainfalls happen and water makes it through the chimney. It just might turn that soot into a mush and then into concrete after it dries out. Scoop it up in a bucket once every 2-3 months. As far as cleaning the actual chimney goes, you ought to do that at least once a year (preferably once every 9-10 months). This procedure, however, is best carried out by a professional. So before we move on to talking about the other wood burning stove precautions we will quickly recap the information above. As you see, it is not so hard to learn how to use a wood burning stove to heat a house when you clean the installation. Did you notice a trend there? The further up the pipeline you go, the less often you will need to clean it. The most effort takes place down there in the firebox and the actual stove – that’s a couple of times a week. Then every several weeks your pipes need to be clean. Eventually, it takes months for your chimney to actually become dangerous. 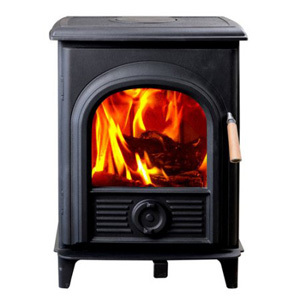 Learning such useful wood burning stove fast facts is actually going to make your life way easier. These next 2 categories are rather easy to handle but we can’t stress enough how important they are. Accidents happen because things are in the wrong place at the wrong time and it is your job to prevent that from happening. In short, don’t leave anything easily flammable around the stove. Expect the unexpected when you are burning wood. You open the door when the fire is burning, oxygen enters, things start moving, little sparks might pop out – it’s easy for things to go wrong. Be ready to handle this sort of thing. Have a little shovel and a poker right under the stove along with fireproof gloves. The first 2 tools you can use if a small amber jumps out and you need to scoop it up and pop it back in the fire. The gloves are useful if a burning log falls on the ground. Grab it and throw it in. Make sure there are at least 4 feet between the wood stove and something which is lying around. *Electric wall heaters, for example,* (anchor to the wall heaters page) require at least 2 feet of distance but their power cannot be compared to the force of a wood burning stove. Fires are caused not only if something ends up inside the stove. As long as an easily flammable object touches the stove or the pipe and remains there, you are running the risk of having a dangerous situation. This is especially important if you have children or pets. Any pillows, tablecloths, plastic toys are not welcome around the wood burning stove. What you want to have nearby is a fire extinguisher. In fact, having such a device is one of the main wood stove insurance requirements. Another useful thing is a jar full of soda. While extinguishers require more presence of mind in a critical situation, everyone can throw a handful of soda on the flames. Fuel is cheaper – imagine having *your space heater running for 24 hours non-stop* (anchor to the space heaters page). Logs and dry wood do not cost as much and give you by far the most heat from a unit. You get enormous amounts of heat – the BTU ratings of wood burning stoves are light years ahead of all sorts of other heating systems. The best part is that you won’t use an excessive amount of electricity. Can be used to humidify the room – leave some water on top and let it vaporize. Requires constant maintenance – not only that you need to often clean your stove but you need to do it properly. Can be harmful to the environment – If you do not clean the stove regularly it will start smoking and will emit harmful particles into the airspace around your home. This is not only unpleasant but can be dangerous and illegal. Fire hazard – It’s tough to have a peace of mind when your stove is running 24/7. Make sure that nothing can get easily ignited around the stove. Take all the safety precautions needed. It is only normal that we have come to the realization that wood burning is by far the most energy-efficient warmth your home will ever see. But it is also obvious that a person’s level of day-to-day involvement is pretty big. Even the best wood burning stove requires proper maintenance and if you are fine with that, go ahead and buy one. We hope that we have provided you with sufficient information on how to choose, maintain and operate a wood stove. 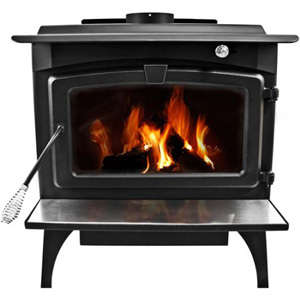 In case you want to let us know about something we’ve missed in our wood stove reviews, please comment the article. Share the guide if you liked and thanks for reading. 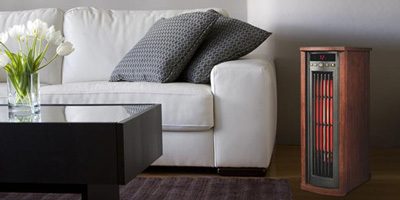 See some of our articles on domestic heating and as always – stay put.